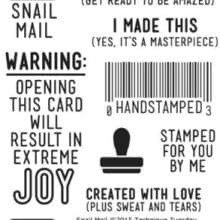 For some time now I’ve been looking at and so today we are Checking out Technique Tuesday Snail Mail Stamp Set. It is time to finally for me to get a set knowing it will be wonderful for enhancing my fall letter writing and is actually perfect for letter writing during all seasons! With September around the corner, I’m envisioning adding some fall leaves, and yes – pumpkins. 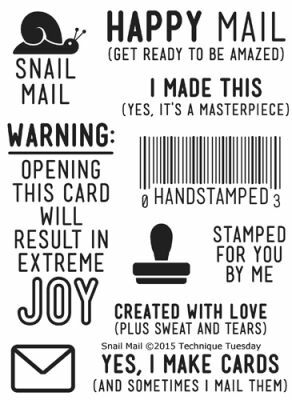 “The Snail Mail Stamp Set includes 10 clear stamps on a 3″ x 4” storage sheet. Made in the USA using the highest-quality photopolymer. Includes 10 clear stamps on a 3″ x 4″ storage sheet. The pricing for the set is right under ten dollars at $9.99. In my post tomorrow it will include announcing the winner of my USPS Summer Sale Contest trivia!